Jed Morgan has added to his growing international resume, claiming the overall boys’ title at the Singapore Junior Golf Championship. The Queensland ace fired rounds of 69-69-69 for a 9-under-par 207 total at the Seletar Country Club, five shots clear of Thailand’s Parathakorn Suyasri. Morgan, never relinquished his 54-hole lead fending off players from Malaysia, USA, China, and South Korea. “My game was very solid this week, I didn’t really put myself in too much trouble,” the 17-year old said. 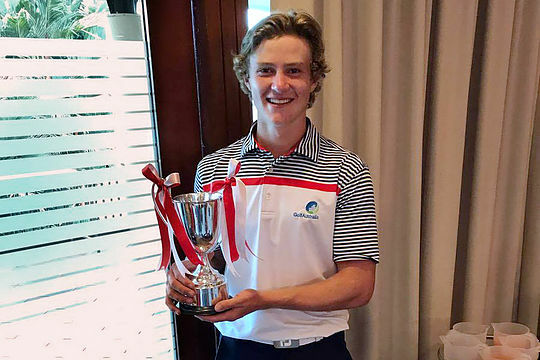 The Hattonvale member has cemented his position as Australia’s third-ranked junior after projecting his name into the spotlight with impressive victories at the Asia Pacific Golf Junior Championship last year and, more recently, claiming three titles at the NT Amateur. “The experience was awesome, it was my first time playing in Singapore, so I really enjoyed it. The course was very challenging, but in awesome condition so it was a pleasure to play,” Morgan beamed. Morgan will return home to contest the Queensland Boys’ Amateur at Bargara Golf Club later this month.